Desert Sky (48" X 54"). 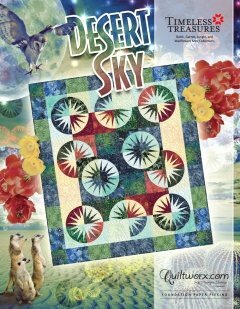 Bradley and Judy designed the layout for the Desert Sky using a selection of bright and dark fat quarters from our Wildflowers Collection, designed by Judy & Judel Niemeyer with Timeless Treasures. Template Layout sheets were designed and provided with these instruction to speed up the cutting process, allowing you to stack and cut your fat quarters in two groups of nine fabrics. An even amount of yardage is needed for each color. This small wall hanging is definitely one to add to your collection. The skill level ranges from beginner to advanced.